The golden rule with any wind turbine is to mount it as high as you can. Wind speed increases rapidly with height and you want to place your turbine in the fastest, cleanest airflow possible. However in practical terms the height and type of mounting tower you choose will be a compromise, a trade-off between performance and cost and practicality. Towers for small wind turbines fall into two main categories. The lowest cost and therefore more common type is the guyed tower. 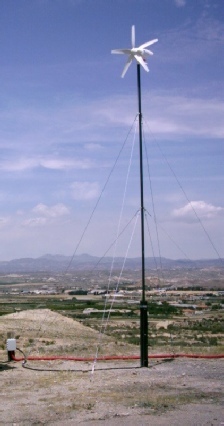 The guyed tower is held vertical by a series of guy ropes or wires that run from the tower to solid anchor points in the ground. The beauty of this design is that the thrust forces on the turbine and tower are resolved by the guy wires. It is easy to specify guys that are capable of carrying many times the maximum load they will ever carry in service, so assuming the anchor points at the tower and ground anchors are well made, guyed towers are tremendously strong. Another advantage of the guyed tower is that the tower itself can be relatively lightweight and low cost. Galvanised steel tube 50-60mm diameter can be used for towers up to about 12 metres. Such tubing is quite flexible and therefore requires support by guy ropes every 5 metres or so. The upper guy attachment on the tower should be immediately below the lowest point of the air blades. Towers can be adequately supported by three wires at each guy point. However it is recommended that four guy wires are used. With four wires it is possible to leave 3 guys permanently in place, and use the fourth as a lifting rope when raising and lowering the tower. This means that the tower cannot fall to one side as it is raised or lowered nor can it be accidently pulled over the vertical. To facilitate this guyed, tilt up arrangement, a steel plate is required to prevent the bottom of the tower tube from sinking into the ground. It is advisable to peg the plate so it cannot move and provide for the tower base to hinge off the plate. Alternatively a more substantial hinged tower base could be cast in concrete. When designing a guyed tilt down tower, the guy radius, i.e. position of the ground anchors, should be equal to the guy height on the tower. This produces a guy wire angle of 45o to the ground, and provides the best support against lateral loads from the turbine. This also minimises compressive loads which could cause the tower to buckle. Therefore on a typical 10 metre tower the guy radius will be around 9.5 metres, so a piece of ground 18 metres in diameter is required for the installation. If space is not an issue, guyed towers can be built to great height. Typically modular lattice type tower sections are used to produce taller towers ranging from 12 to 30 metres in height. Regardless of the form of the main part of the tower, the turbine itself should be mounted on a stub tower, i.e. a piece of tubing 50-60mm diameter and 500mm long. This is to provide adequate clearance between the air blades and tower, and also to minimise the obstruction in the air flow at the turbine’s wake. Raising and lowering tilt down guyed towers requires the application of mechanical advantage. Usually a gin pole or ‘A’ frame is temporarily attached at the tower’s foot. This allows the force applied to the lifting rope to act upwards at the top of the tower. The longer the gin pole the easier the lift. Even so, a winch will be required to apply sufficient force to lift the tower. The hardest part of the lift is when the tower is laid down near the horizontal. As it rises, the load diminishes. Where there is insufficient space for a guyed tower, or the guy wires would present an unacceptable hazard, the option is a freestanding tower. Freestanding towers are typically made of tubular steel. As they have to resist the bending loads imposed by the wind turbine they are much larger in diameter and heavier than a guyed tower. They also require a substantial concrete foundation in to which the base is embedded. The weight of the tower means that a crane will be required to achieve the installation. For small turbines it is possible to source free standing towers that tilt down to facilitate turbine installation or maintenance. The tilt mechanism is usually hydraulically operated due to the very large forces involved. Some lighter towers suitable for turbines up to around 1.5 metre rotor diameter are hinged 2 metres upwards from their base. This type of tower can be raised and lowered with a specialist wire rope type winch. As with all structures intended to mount Eclectic’s D400 and StealthGen turbines, the chosen tower should provide for a minimum safe working load of 70kg in a lateral direction at the hub height of the turbine. 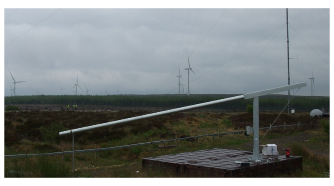 A stub tower of 50-60mm diameter and approximately 500mm long should be used to mount the turbine to the main tower. It is important to ensure that the tower is absolutely vertical. If it is not the yaw action of the turbine can be adversely affected. Freestanding towers are typically adjusted by placing shims under the baseplate, or by moving nuts on the foundation studs. Where a freestanding cantilevered tower does not tilt down, installing or removing the turbine has to be done at height. Great care should be exercised with all installation work but working at height requires particular attention to safety. Small turbines are best installed using specialist equipment such as a scissor lift type access platform or a hydraulic cherry picker. The job could also be done from a scaffold towers. On no account should installation ever be attempted from ladders! Larger turbines would require a crane to lift them to height.